The page from my great-grandfather’s Scrap Book which caught my eye. It was the lower picture, featuring the installation of Big Ben, a bell cast in the Whitechapel Bell Foundry I had visited a week or so before, and the subject of last week’s post, which caught my interest. My great-grandfather had even pasted in the journalist’s article on the event. As I read it, I realized that I could add to what the journalist had said back in 1858. View of the Whitechapel Bell Foundry. 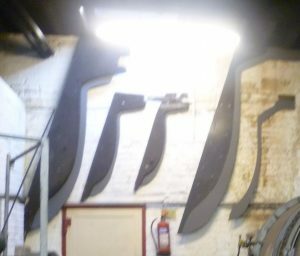 On my visit to the Whitechapel Bell Foundry, I had actually taken a photograph of the very moulding gauges made for the casting for Big Ben. You can see their curves shapes hanging up on the wall behind. This is obviously a working building – it looks chaotic but it’s effective. Detail of the moulding gauges. The large pair on the left are Big Ben’s. The Big Ben we know today was not the first of that name. 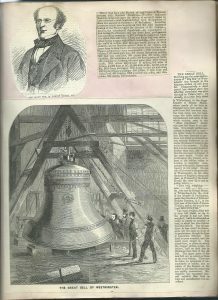 The original bell was a 16 ton hour bell, cast in 1856 by John Warner & Sons. It was pulled to the tower on a trolley drawn by sixteen horses, to cheering crowds. Unfortunately, during the bell’s testing, it cracked beyond repair and a replacement had to be made. 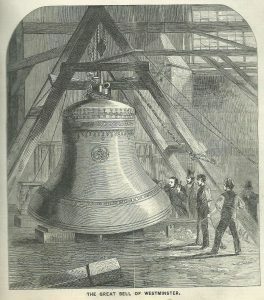 So the new bell mentioned in the article is the Whitechapel Foundry’s Big Ben. The casting of Big Ben from a contemporary print. Note how clean and tidy the foundry is, compared with the photos of what the foundry really looks like in my last week’s post. About this new bell there is no mistake. It is simply perfect as a casting in shape and in tone – the latter being E, which the late Ben was intended to produce, but which good intention was entirely frustrated by an undue thickness of metal in the waist of the monster. To Big Ben it is not necessary to allude further than this, and to say this his successor is formed of the same metal. Unlike his predecessor, the present occupant of the loftiest belfry in London is tastefully ornamented with Gothic figures and tracery in low relief. On one side of his waist is the portcullis of Westminster, on the other the arms of England, sharp and clear, as if chased by the hand. I checked George Mears, the bell’s maker, in the Whitechapel Bell Foundry’s excellent guide. The list of master bell founders goes back to 1420. In 1781, the Whitechapel Bell foundry was run by Chapman and Mears. In 1784 William Mears took over and the line continued from father to son until 1873. George Mears, who was responsible for the casting of Big Ben, is first heard of in 1844, working with his brother, Charles. And by 1861 the business is being run by George Mears & Co. 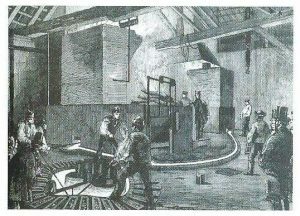 The journalist might talk dismissively about the ‘dingy foundry of Messrs. Mears’, but, in fact, it was obviously a well-established, reputable, and successful, business. According to the Whitechapel Bell Foundry guide, Big Ben weighs 13½ tons. 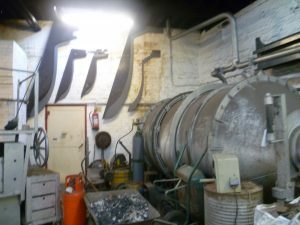 I enjoyed finding out more about the Whitechapel Bell Foundry from the other end, as it were. It was an interesting co-incidence that I felt was worth exploring. I agree. Whoever the journalist was had a ‘bluff fellow no nonsense about ME’ sort of approach. A bit of a snob, too, I think.